Deadpool screenwriters Paul Wernick and Rhett Reese are attached to pen the script about a man who won the million dollar McDonald’s Monopoly grand prize with the help of a criminal support system, but who was found out by the FBI. As Deadline reports, the crooks were ultimately brought down by “a sting that began with a tip about an ‘Uncle Jerry,’” who’d sell stolen game pieces. Solid detective work unearthed Jerry Jacobson, a head of security for a Los Angeles company responsible for generating the game pieces. It led to a wide conspiracy that involved mobsters, psychic, strip-club owners, drug traffickers, and a family of Mormons who falsely claimed to have won more than $24 million in cash and prizes. 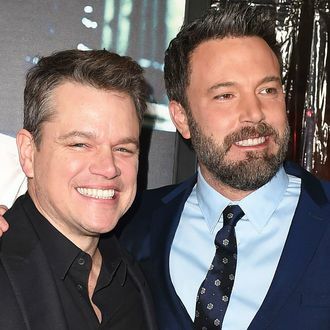 Affleck will direct, Damon will star, and the movie will be developed by the Hollywood buddies’ Pearl Street banner in association with Fox. Everyone wants in on the summer of scam.